Children dressed in Santa Claus costumes sit and sleep inside a classroom before participating in Christmas celebrations on 20 December at a school in Chandigarh, India. A Chaldean Catholic archbishop from southern Iraq has warned that the country’s beleaguered Christian community still feels pessimistic about the future, despite the recent announcement by the government that troops have defeated Islamic State. He also said Chaldean Catholics, who worship in the Aramaic language that Jesus spoke, “are afraid that this language will disappear in the next generation because our community is now distributed everywhere.” He said there are currently Chaldean communities in 64 countries, and many of them are now worshiping in the local language rather than their mother tongue. Describing what has happened the Christians in the country as “genocide,” he said the international community should make it a priority to protest the rights of the native people of Iraq, including the Christians. “We need support politically from Western leaders, and Christian villages need help economically to open workshops to provide employment or for the reconstruction of houses,” the archbishop said. Asked about preparations for Christmas, the archbishop said that the 400 or so families who remain in his congregation are “people of deep hope and immense faith.” Describing how he has received numerous death threats during his ministry, he said, “I trust in God, the Chaldean people continue to trust in God — our faith is deeply rooted, we have been here for almost 2,000 years. That’s a long time. “We have only the Spirit of Jesus with us. We have a strong faith; people lose everything but they stay Christian, thank God for that,” he said. The Prince of Wales has described his profoundly shocked at the suffering endured by Catholics in Syria. Addressing the Melkite Greek Catholic Community in London, along with their hosts from the Anglican Parish of St Barnabas in Pimlico, and friends from other churches, he said it was “a particular privilege” to be able to celebrate the birth of Christ with a community that traces its origins to the very earliest Christian communities in the Holy Land. “As someone who, throughout my life, has tried, in whatever small way I can, to foster understanding between people of faith, and to build bridges between the great religions of the world, it is heartbreaking beyond words to see just how much pain and suffering is being endured by Christians, in this day and age, simply because of their faith,” he said. “The Christian faith in the area is nuanced,” says Father Vasylii Hunchak, pastor of the Ukrainian Autocephalous Orthodox parish of Sts. Peter and Paul in Kosmach. “There is faith, but it is not exactly Christian, rather half-Christian, half-pagan ... a mystical faith. In the Carpathian Mountains, there are people who know about trees, plants, nature.” The Hutsuls are intimately connected to nature, the elements and to their dead. On Christmas Eve, grandchildren carol for their grandparents. On Christmas Day, older children carol. After that, however, only adult men who have permission from their pastors may carol. Proceeds from the singing — carolers receive “tips” — are donated to the parish. 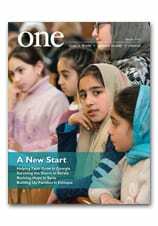 Read more about Faith and Tradition in the November 2004 edition of ONE. One of the great undiscovered resources here at CNEWA is hiding in plain sight: it’s our YouTube channel. Since it was launched six years ago, the channel has become a repository of inspiring, sometimes profoundly poignant videos that show CNEWA’s world with surprising power and intimacy. Here you will see some of the projects and programs we support, meet the dedicated men and women bringing these programs alive, and see first-hand the tremendous good work our donors are making possible. Take a few moments to browse our archive and you will meet some of wonderful people we are privileged to serve from places as varied as Armenia and Georgia, Iraq and Ethiopia. We believe these videos—in every sense, “moving pictures” — help to tell our story in a way that enhances and enriches the work of our magazine ONE and our blog One-to-One. Together, these media resources help open a window to our world — and offer a glimpse at the courage, faith and hope that animate our mission. The channel is updated frequently, so bookmark the page and revisit often!